Everyone hates a cold. Even the mild ones are unpleasant while more severe colds cause us to take time from work or interfere with our family life. One study of 499 children in 1999 showed that those children whose colds were treated with homoeopathy were more likely to feel and do better than those children whose colds had been treated conventionally. The homoeopathically treated children also had fewer complications, and their parents took significantly less sick-leave than the parents of those children treated with antibiotics. Another 1994 study of 175 children at a University Hospital showed that those given a homoeopathic remedy had less symptoms and needed fewer antibiotics than those who had been given a placebo. They also went on to need fewer adenoidectomies. For the brave and adventurous, we have also provided cutting edge information on how to help a cold with wet socks and peroxide. Just read down to, ‘Strange but True’ to try them out. Please enjoy and nip those sniffles in the bud. Billions of colds happen every year, especially during the cooler autumn-winter months. They are caused by virus a which enters the body through the mucus membranes of the nose or eyes. Symptoms normally appear 2–3 days after exposure, at which time the person is then infectious to others. 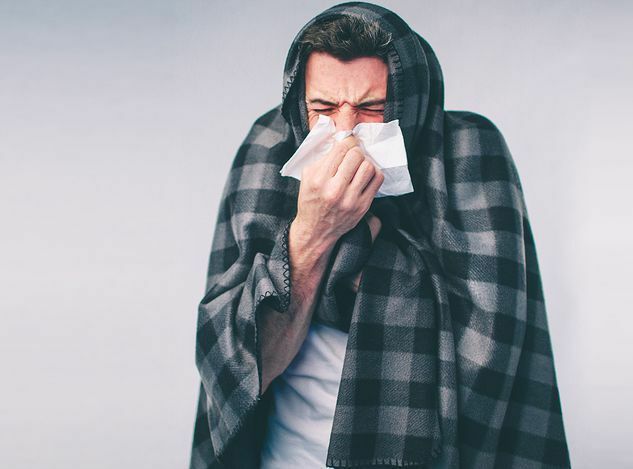 Although the common cold is mostly regarded as a nuisance disease, it can lead to complications such as sinusitis, bronchitis, and pneumonia. The disease usually progresses from one symptom to another until it has run its course over a 3 to 7 day period unless other opportunitistic bacterial infections take hold while the person is in a weakened state. Wash your hands. Surprisingly, air-born viruses, coughed and sneezed by sick people, aren’t the main way colds are spread. They usually travel by skin to skin contact so shaking hands with someone with a cold, or coming into contact with something they have touched will transfer the virus. Wash your hands frequently when you’re around someone with a cold to reduce your risk of catching it. Don’t rub your eyes or nose. Likewise avoid rubbing your eyes and nose, especially if you haven’t been able to wash your hands, as these are the two main points at which the virus enters your body. Vitamin D helps the immune system respond to viruses and bacteria. It is manufactured in the skin when it is exposed to sun so make sure you get at least 30 minutes of being in the sunshine each day. Make healthy lifestyle choices such as getting enough sleep, drinking pure water, and eating fresh and healthy food to build up resistance to coughs, colds and flu. Be happy, don’t worry. Research has shown that a cheerful, optimistic outlook strengthens immunity. Not only that, but optimistic people who do catch a cold describe less symptoms than others. Laughter also releases endorphins which promote happiness and reduce the discomfort of a cold. Drink plenty of fluids. Drinking 8 to 10 glasses a day will thin the mucous and make it easier for your body to expel. Try drinking extra fluid with lemon juice, or turning it into a herbal tea for additional benefits (see below). Go slow on the milk. Reduce, or stop, your consumption of dairy. Dairy stimulates the production of of mucous, especially in those who are sensitive to it, which in turn supports the growth of viruses and bacteria. Rest is one of the most important things you can do when you’re sick. Illness is your body’s cry that it needs some time-out so listen and let it recover. Oysters are high in zinc, a mineral that is vital for immune function. It assist the helper T-cells of the immune system to recognise foreign invaders. Yogurt and kefir contain micro-organisms called probiotics that increase the body’s white blood cells which protect against infections and harmful bacteria. Eat one to three serves every day. Oregano is one of the best herbs for a cold. It is an excellent anti-inflammatory that contains phenolic acids, flavonoids and colour compounds that increase resistance and boosts immunity. Lemon: When the body is sick it is usually too acidic. If you know this is the case with you (test your urine with a pH strip from the chemist), drink the juice of a lemon squeezed into a cup of water or tea every few hours. Even though lemons taste acidic, their juice helps to alkalinise the body once drunk. Garlic is fantastic at treating sore throats and infections. Crush five cloves and mix with half a cup of honey. Let it sit for a couple of hours (it will become runny and thin) and take teaspoonfuls as needed. The same thing can be done with some onion rings. The concoctions taste a liot better than they sound! Cinnamon is another natural antibiotic. It is rich in compounds that inhibit bacterial growth and strengthen resistance. Add it to your food or drinks to boost your immune system. Turmeric contains an anti-inflammatory compound called curcumin, which has strong cold and flu fighting properties. Stir a teaspoon into a glass of water or use it in your cooking. Cayenne pepper Take a teaspoon of pepper in a glass of water immediately you feel a cold or sore throat coming on. Its strong stimulatory effect can be enough to knock a cold out in the early stages. Chicken soup, homemade from scratch (yum! ), contains a natural amino acid called cysteine that thins the mucous, allowing you to expel it more easily. Spices, especially the hotter ones used in curries, also thin mucus so it can be expelled easily. Ground fenugreek seed for example will cause your nose to run, as does chilli, black pepper, and other ‘hot’ seasonings. Honey and lemon soothe the mucous membranes of the throat and have an antibacterial effect – raw honey is best. Research shows that children who take a spoonful of honey before bed cough less and sleep better than those who take over-the-counter products for coughs and colds. Adding a little lemon to the honey will increase its anti-microbial effect. Honey and lemon can also be combined with hot water to make a soothing tea. Ginger is a stimulant that will also warm you if you’re feeling chilled with your cold. It’s best used fresh rather than as a powder so peel and grate a small piece of ginger root and place in a cup of boiling water. Allowed it to steep for five minutes, sweeten with honey if desired and sip whenever needed. Herbal teas such as oregano, sage and thyme also relieve the symptoms of a cold. Add a teaspoon of dried herb to a cup of boiling water and steep for 10 to 15 minutes. Strain and sweeten the liquid with honey if desired, then cool and store in the fridge. Take a teaspoon every hour as needed for a day or two. Peppermint can clear blocked noses and sinuses. Enjoy it as a stimulating tea or add some teabags of it to your bath. Vinegar can also ease congestion. Place some heated vinegar in a small bowl and gently inhale its vapours. Believe it or not, wet socks can trigger a reflex response from your body that relieves nasal congestion so you can have a better night’s sleep. Before going to bed, warm your feet in a tub of hot water so they are hot and pink. At the same time soak a pair of cotton socks in iced water. Wring them out so they don’t drip and immediately place them on your feet (ooh!). Cover your icy socks with a thick pair of woollen socks and then climb into bed as quick as you can, making sure you are covered and warm. This is simple hydrotherapy approach triggers a reflex in which your surprised body immediately increases its circulation which then clears blocked nasal passages and speeds up the activity of your immune system. Several researchers claim that the cold virus actually prefers to enter the body through the ear rather than the nose and eyes. They say that a cold can be stopped in its tracks during the early stages if drops of 3% hydrogen peroxide are placed in each ear to disrupt the replication process of the virus. To do this, tip your head onto one side and have somebody gently place some drops within your ear. The liquid will fizz, producing a tickling sensation that sometimes mildly stings, but this is harmless. Leave the drops in place for 2 to 3 minutes, until the bubbling stops, then tip your head over and drain the fluid onto a tissue. Do the same with the other ear. This process may need to be repeated a few times every 1 to 2 hours until no more bubbling occurs when the peroxide is placed in the ear. If this approach is applied early enough, the virus will be destroyed leaving you cold-free. You should also have very clean ears! When it comes to health-care it sometimes seems we have lost our way. While most of us know that manufactured chemicals in our food, cleaning aids and personal products are causing some serious problems, we seem to be less aware that the same thing is true with our medicines. In Western society we are now so dependent on chemical drugs for our health-care that we have forgotten that simple measures can work just as well and with far less risk. Let’s look at what some of those risks are. In 2008, the Australian Therapeutic Goods Administration (TGA) decided that over-the-counter cough and cold medicines should not begiven to children younger than 2 years of age. Drug regulating bodies in other countries such as Canada said they should only be given to children 6 years and older. But it is not just children who can be affected. Pharmaceutical companies will tell you that all cold and cough medications cause side-effects that affect some people more than others. Until the medication has been taken, and perhaps more than once, there is no way of knowing who that person will be or how marked the side-effect. A quick look at a typical list of cold and cough medication side-effects includes: dizziness; excitability; headache; nausea; nervousness or anxiety; trouble sleeping; weakness; severe allergic reactions (rash; hives; difficulty breathing; tightness in the chest; swelling of the mouth, face, lips, or tongue); difficulty urinating; fast or irregular heartbeat; hallucinations; seizures; severe dizziness, lightheadedness, or headache; stomach pain; tremor; yellowing of skin or eyes. If resorting to these chemical medicines for your simple cold it really is a case of Russian roulette, or buyer beware. Maybe it is time to think carefully and try some of the safer options first. Treating yourself with homoeopathy for simple acute problems is easy aslong as you know how to choose the remedy that matches your symptoms. The common cold is the perfect opportunity for you to practice and become familiar with homeopathy. Unless you prefer to, there is no need for you to see a homoeopath first, and all remedies are safe for use with babies through to the elderly when used according to instructions. To treat your cold, look through the remedies listed below to see which one matches your symptoms – then just take it. Instructions on how to dose, and how often, can be found here . If there is no improvement by 3-4 doses just reassess your symptoms and choose another remedy. Should you find it difficult to identify and sort through your symptoms, ABC Homeopathy has an online remedy finder that can make it easier. Alternately, an appointment can be made with a homeopath who will try to get to the bottom of things for you. Many of the above remedies are found in home-use kits. de Lange de Klerk, ESM, Blommers, J, Kuik, DJ et al., “Effect of Homoeopathic Medicines on Daily Burden of Symptoms in Children with Recurrent Upper Respiratory Tract Infections,” BMJ, November 19, 1994;309:1329-1332.